Prepped yardbird this morning and it went much better, I used several tips from above. Used the aluminum foil and paper towel on a cookie sheet, after taking bird out of package. Put on two pair of surgery gloves, and used a wire rack on a cookie sheet to apply rub and to put in fridge after seasoning. 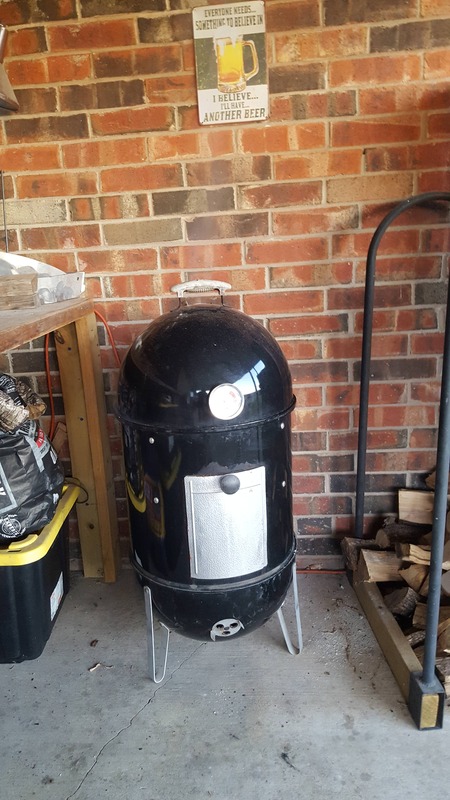 Will smoke them on the 18 WSM later this afternoon. Old dogs can learn new tricks and it never hurts to ask. Thanks to all that responded. 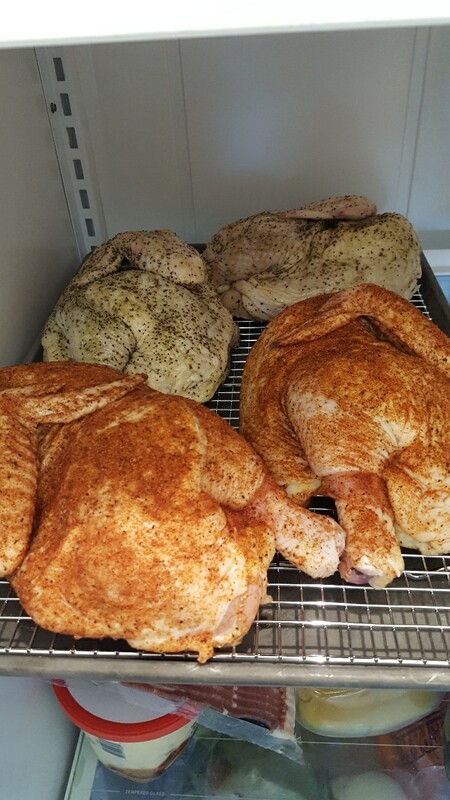 Here they are with Plowboys Yardbird rub and two others with Cavender's Greek Seasoning. Somebody's going to be eatin' good!! Gosh, I ALWAYS rinse chicken, spatch, then onto a pan covered with paper towels where I dry it. Season, then into the fridge for a while before cooking hot & fast on the WSM. I always clean the sink and prep area afterwards. Have I been doing it wrong all these years? I've been rinsing my chicken for.....ever. I always give a complete wipe down with some disinfectant after. I would do the same even if I didn't rinse. I'm not sure I see the harm. You all seem to be a lot more carefull than me. I unwrap the chicken in the sink and put straight on the rotisserie or on a cutting board if I want to cut it up. From there it goes on the grate. It can sit and dry out a bit if needs be, but I figure that the heat of the fire is hot enough to crisp the skin anyway (I always manage crispy skin, even if it is by putting it on direct heat at the end of the cook). Throw away the chicken wrap, wash my hands and the sink and that's all. I just cut up a whole chicken this morning for my dinner. I went straight from the package to the cutting board, then into Italian dressing. I sprayed everything the chicken touched down with a bleach cleaner solution and washed them with hot water and Dawn. That’s my method for years now. I grilled the chicken pieces at around 350 until everything temped at 160 degrees or more. I don't see many people using fast food (or cafeteria) trays but they work in place of cookie sheets, plus they're soft so you can cut on them. I have probably a dozen, color coded (red & gray). Red is usually for electronics (etc) repairs, I use the grey for food. 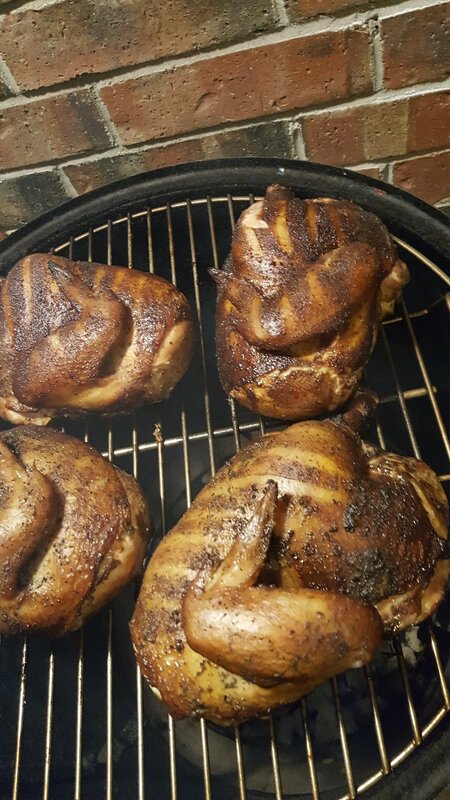 Wow, that Yardbird looks gorgeous! 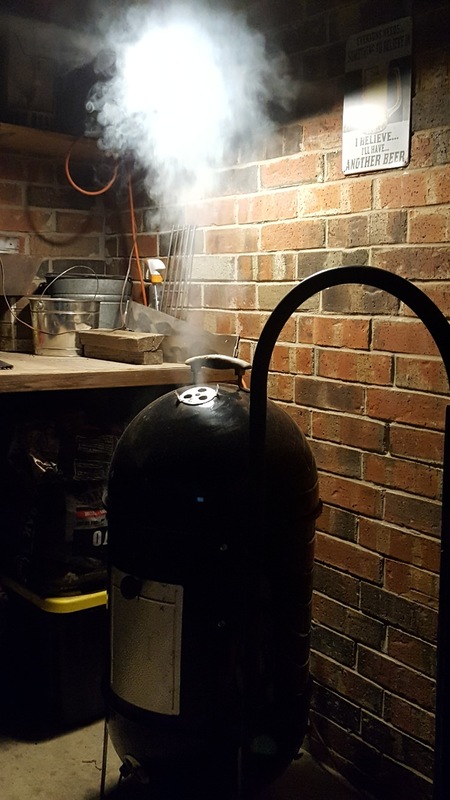 That's a really cool grilling/smoking area. Honestly, IDK what to think about the color, its darker than I'm accustomed to ...... could've been the rubs, I've not used them a lot , or could've gotten too much smoke. But I used what I thought was about the same size cherry chunks I normally use. Or maybe just the lighting, it was after dark. Flavor was great though. Hey, If it tastes good, what does it matter what it looks like? Cherry tends to darken poultry, in my experience. But it tastes great. I don't have much to add on the advice already given. But I just threw a whole roaster in the oven about 90 minutes ago and prep seems to be the key ingredient. When oven roasting, I throw some celery, carrots, onion and apple in the pan below the bird and usually some citrus and herbs in the cavity. I make sure those are ready before I start handling the bird. Also make sure I have the rub/seasoning ready to go in a container that I can reach into. So if its store bought, I dump out my required amount into a bowl so I don't have to handle the spice container. I don't rinse anymore, but will 'unveil' the bird in the sink, then move to a cutting board, cookie sheet or the roasting pan. Usually have a paper towel or two in there to absorb any drips. Then I season , truss if needed and get it in place. Then I wash my hands and begin cleaning utensils, and sink. Once all that's done, I was my hands again. Not as involved as it sounds, I promise. BTW: love the Cavenders Greek rub. You're making me want to get some pitas, roast some red onion and make Tzatziki.